"YouTube™ Hits" searches reddit.com/r/Music channel once per while and extracts currently trending YouTube music videos. To play a music video simply press the toolbar button. 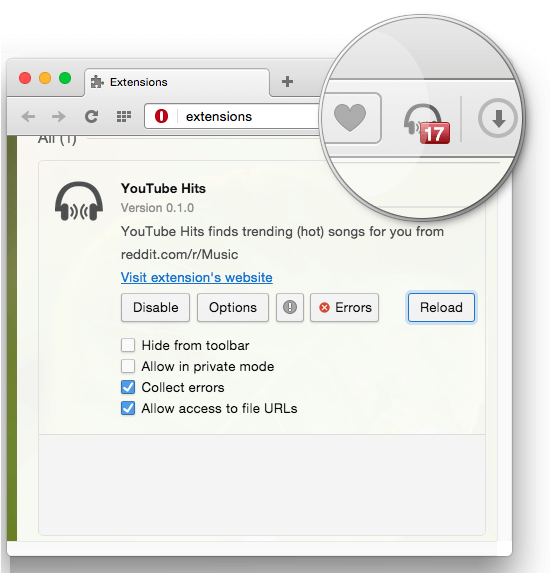 What is YouTube Hits extension? YouTube Hits is actually an RSS reader optimized to work with reddit.com/r/Music channel. It listens over hot rss channel of /r/Music and extracts direct YouTube songs from this channel. Whenever a new song is added to the library, the badge number is updated to notify you. Whereas other RSS readers, YouTube Hits has an internal storage to filter out already played musics. This will guarantee you will get only fresh musics not just currently trending ones. What is the badge number on the toolbar button? The badge is the number of new trending musics on /r/Music channel that have not been yet played on your machine. Yes, in Firefox browser please read the guide here, a Comprehensive Guide to Firefox Customization. For Google Chrome and Opera read the Customize your Toolbar article. For Safari users, the instruction is available at Customizing the Toolbar. Where can I find the change log of the extension? You can visit Mozilla's version page for the outlines. If you want more through log, please check the GitHub's commit section of the master branch. What is the time interval between each updates? YouTube Hits fetches new tracks once per every 30 minutes. This process is automatic, meaning there is no need to hit the toolbar button to get the fresh list. Note that the maximum number of tracks stored in the internal storage is 200. Can I select the Music Genre of the feed? Not currently, well reddit.com/r/Music does not provide Music Genre however YouTube does (kind of does). I am working on this to see if Music Genre can be fetched from YouTube or not. Why does the extension sometimes opens non music YouTube clips? Currently, the extension only checks the reddit.com/r/Music feed for YouTube links. Meaning if there is a non music but trending clip there, still the extension considers it as a trending music. There is a plan to filter out the non music ids.